We are at our favorite coffee house – The Daily Grind – working our next project. Script writing is somewhat different than writing in book format; not better or worse, just different. As stated in earlier posts, the coffee here is excellent. In the picture is a particularly good variety from Counter Culture. Here is a picture of me goofing off and Paul actually getting some work done. For my Facebook people, if you saw this already I apologize, I had to do a quick edit. In search of coffee, Paul and I left Charlotte at 6 am bound for Chattanooga TN and LibertyCon 31. On the way – clearly the coffee had already kicked in. For those of you who don’t know, that’s Paul on the right and the long haired, fat old guy is Steve. This was our first appearance at LibertyCon and it did not disappoint. As first timers, we were only on a few panels, but that allowed us to take full opportunity of the variety of content put on by this convention. But I digress: We arrived at LibertyCon set in Chattanooga TN on Friday around 1 pm. Our first event was a book reading at 2:00; the plan was a quick run to our hotel to check-in, freshen up after 6+ hours on the road and then off to the event. Unfortunately our room wasn’t ready yet, but the staff gave us a key to the parking garage so we could park our car and make it to our event in a timely manner. I should mention here that we stayed at the Chattanoogan Hotel, I would highly recommend this hotel if you are ever in the area. The staff was exceptionally friendly and helpful, the rooms were large and clean, the beds comfortable and most importantly, complimentary coffee in the lobby. Be warned, they don’t believe in decaf on days of the week that end in “Y”. And yes, the fire pit was burning every night…I’ll let that sink in – For those of you not familiar with the South during the summer, “hot and sticky” are not just quaint descriptors in novels and movies. I must be an Author – it says so on my badge. On to the opening ceremonies: as opening ceremonies go, this one was well above average. The MC was Peter Gannon who was outstanding and put on an excellent presentation. He is well spoken, humorous and knows his audience. Gary Reinhart did a very cool version of the song Brandy about the family that puts on the event every year. Before my panel at 7pm Paul and I decided to attend a workshop on Scrivener for writers. Paul is already a fan of the program but I still do everything in Word. After the presentation I was convinced to at least give it a try. There is a 30 day free trial that you can download. I should mention that the presenter is an author and in no way connected with Scrivener. After giving it a try, I will follow up with a review. At 7pm I was one of the panelists on a presentation aptly called, “No sh**!!! There I was Minding my own business…” Again, they must not have known who I was, because the participants are all heavy hitters in the military and law enforcement realm. The panel was in one of the ballrooms and, as panels go, was a full house. When we first heard that the panel lasted for two hours, we were a little worried, however after it got going, it was clearly not enough time. Apparently, people in those particular professions can spin a pretty good yarn – or are full of it, I’ll let you be the judge. Either way, the audience stayed the entire time, so there must have been something entertaining going on. Most of the stories either involved alcohol or folks in various states of undress, so I guess there is a certain staying power. Here I am trying to set up my books before the panel started. Keeping with the alcohol theme, after the panel, several of us continued the sea story session back at the bar where I met some fellow bloggers that I like to follow. Some of us even exchanged our newest books with each other. Very cool night and end to the first day. After breakfast the next morning Paul and I had a private session for new writers with Bill Fawcett, who is a game designer and writer. He is also married to Jody Lyn Nye, so their credentials alone are worth listening to what they have to say. He answered our questions and offered seasoned advice on some of the pit falls of writing and some next steps we might want to consider. All in all an excellent meeting. The lighting was such that we had to take this at an angle, but you get the idea. That’s Mary, one of our new fans – at least until she actually reads our book. Oh, I should mention that you know you are in a hotel when you spend $12 on a bowl of oatmeal. Not unexpected and yes, it was as good as it looks. Not only is Paul an author with Fiery Seas Publishing, but he is also with Copper Dog Publishing in their Sha’Daa anthology. They had their reading and new book release shortly after we finished selling our wares in Author Alley. Each writer in the anthology took a turn reading 5 minutes from their piece. After they were done they took questions from the audience. Sorry, again no pictures, I was busy during that panel enjoying a cold adult beverage with another writer I met on my earlier panel. But, continuing on the theme that there is more to Paul than just being an author, his day job is in the film industry. Here he is on a panel on the art of film making. Ignore the face he is making; let me just say that Paul has been in the business since he was 14 years old and has forgotten more than most people know about the making of film. He has done it all, from producer to grip but his current jobs are props and script supervisor. He also leads a panel on the unsung heroes of film making. If you ever get an opportunity to attend one of his panels, you won’t be disappointed. LibertyCon had the Atlanta Radio Theatre Company (ARTC) attend and do a performance. This is a group that puts on live event like the radio shows of old. They did Terrific Park by George Alec Effinger and The Man Who Traveled in Elephants by Robert A. Heinlein. They were excellent and a great way to finish up a very busy day. Here is a promo picture from their web site to give you an idea of the setup. Sunday morning there is an event called Kaffeeklatsch where everyone who is an invited guest gets an opportunity to meet everyone else. Basically a big meet and greet with coffee and nabs. I got pulled in to a table with Paul full of movie makers. Not my forte but had a good time listening to them and had an opportunity to impart some knowledge on police and SWAT operations to an interested party currently working on a film involving just that. After the Kaffeeklatsch, we headed to the dealer room for our final book signing. In theory, this is where people who bought your books earlier, can come to get you to sign them. In reality, most of the books had already been signed, but it was another opportunity to sell some product which we did. One patron came through and bought one of each. Apparently, he is a collector and does that every year. He said he just built a 20 by 40 room addition in his house to hold more books. Now that is a fan of the written word and I wish there were many more like him. I wish we could have gotten a picture with him at our table, but it didn’t work out. Here we are at the Sunday signing. All in all an excellent Con and I hope we are invited back again next year. We hope to have two more books by then and Paul might have some of his movies to sell also. This particular convention sells out early as they only allow a limited amount of participants, this year it was limited to 750 people, but the entire event is for charity. This year all proceeds went to Room at the Inn. Thanks to all who read this far in – and as always – support small pub and indi authors and buy our stuff! Okay, this is pretty cool. Paul and I are guests at LibertyCon 31 in Chattanooga, TN. Our publisher made this flyer up for us, so I thought I would share. We are also on a couple of panels, so if you get a chance, drop by and say hello; and don’t forget to grab a book if you haven’t already. I’ve been thinking more and more about this writer thing and how to be more productive. Disclosure – the above picture is not my writing space, more of what I envision. My current “nook” is way too crowded and disorganized. It also has multiple uses, the most prominent being where I conduct all of my business for a small company my wife and I run, but that is for another post. Paul and I seem to do some of our best writing out and about, usually at a coffee shop or restaurant. Currently that is a small locally owned shop near by called The Daily Grind. The owner, Tyler, is very forgiving of our long hours and makes an excellent, well, anything you could want from a coffee house. But I digress. Back to my current office. Every time I look up or over, I see work for the business that is not getting done. Several people have already “complained” that our second book is not further along and I couldn’t agree more. We are 53000 words into the first draft on a 120000 word novel. Not even half way. It seems like we have been stuck at this number for awhile now. One of the reasons is that after writing a chapter or section, you go back and delete your notes. It seems like taking two steps forward and then one step back. My solution is to move all of the business materials into a corner of my wife’s office and do any work associated with the business in there. Before getting your skivvies in a wad, this was at her suggestion. She wants to read book two as much everybody. For those who don’t know, I married up. My “nook” will certainly not look like the one above – for now at least, but I will hopefully be able to get the feng shui right for optimal wordsmithing. “Shaking the tree boss.” Back to work. 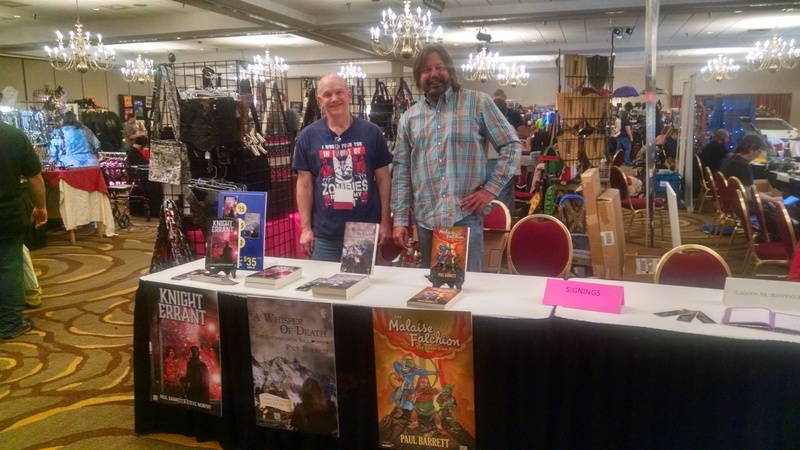 Paul and I attended RavenCon13 or RavenCon 2018 depending on who you ask. It was the 13th Con held in 2018 if you are wondering. Had a great time and learned a lot from the gathering of misfits and geeks that are the SciFi writers and readers of the world – Rock On! or should that be Geek On? Either way we had a great time. I will follow Paul’s lead and bullet point my takeaways from the convention; with the exception of the first bullet point, they will be in no particular order. I got to meet Chuck Wendig this weekend. If you don’t know his work you should get to know it and buy his books. I’m telling you, he has something for everyone. He is a voracious writer with over 20 novels to choose from. As Chuck says, “Trust me, you really need some Miriam Black in your life.” He is also just a great guy, down to earth, funny, and good to be around. He made himself available to con goers all weekend – either sitting on panels or while walking the halls, he had time for fans and authors alike. 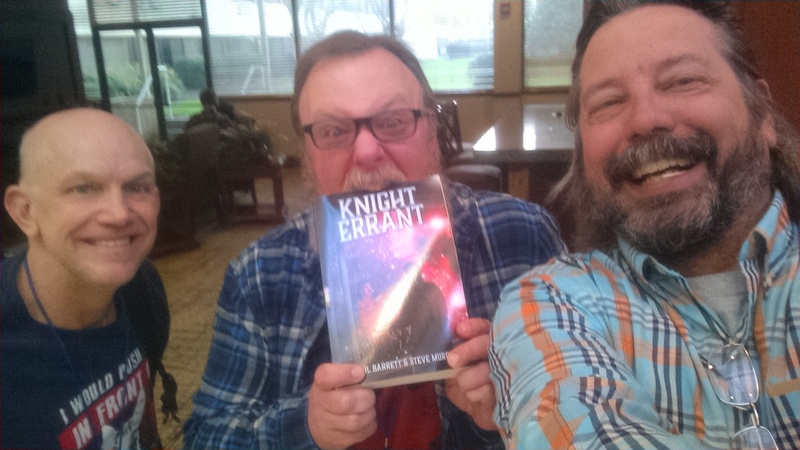 We even talked him in to taking a bite out of our novel. Like I said, get to know him, you will not be disappointed. All of the panels I attended were excellent. All but one I should say – some people take themselves way too seriously and just like to hear themselves talk, but all of the others were well thought out and the panelists were knowledgeable of the information being presented. I will submit to you that if Chuck Wendig, John Hartness and Michael A. Ventrella hosted a panel on the air velocity of a coconut laden swallow, it would be worth attending. I will take a moment to mention a few of the panels that I thought were excellent. This is not to say that others weren’t, but these stood out in my mind. Packaging your book to sell – this panel covered everything from software for publishing to Fonts. Promoting yourself as a writer – covered social media, trends, meta data, all the way to person to person marketing. But first and foremost – WRITE BOOKS! Don’t worry about promoting what you don’t have. Editing – Yes, you need an editor! At the end of the day, it is your name on the book. Covered story editing, copy editing and line editing. This is a small Con so there is a lot of opportunity to engage in a meaningful way with other authors, publishers and fans. The hotel – The Double Tree by Hilton – is an excellent venue; close to several restaurants within walking distance and several more just a short drive away. The hotel food was average and somewhat pricey, but the staff, to a person, was excellent, friendly and helpful at every turn. Here we are at our book signing. Hopefully next year we will have two more books to sell on the table. Paul’s next book in his Necromancer series will be out and hopefully the next book in The Knights series will also be out by then. Three books look a little thin on the table. Our next convention will be LibertyCon in Chattanooga, Tn. on the weekend of June 29th. When we receive our itinerary, the panels we will be on and the times of our book signings, we will let you know. I stole this from Peter Grant over at his blog. I really need to learn how to link other blogs. He does a great job of explaining how book reviews drive sales and why new and independent authors shamelessly ask readers for them. I know some readers find it frustrating when independent authors, such as myself, ask readers of their books to leave reviews on Amazon.com. They don’t like to be bombarded with such pleas. I try very hard not to issue such appeals too often: but reviews are important, as the New York Post explains. That’s the key takeaway from a new study published in Psychological Science, which finds that if two similar products have the same rating, online shoppers will buy the one with more reviews. The study concluded that consumers see products with more reviews as being more popular, and they’re more comfortable having what everyone else is having, regardless of quality. “[When] faced with a choice between two low-scoring products, one with many reviews and one with few, the statistics say we should actually go for the product with few reviews, since there’s more of a chance it’s not really so bad,” wrote researcher Derek Powell of Stanford University, lead author of the report. In other words, when there’s only a handful of reviews, a few bad ones break the curve and bring down the overall rating. “But participants in our studies did just the opposite: They went for the more popular product, despite the fact that they should’ve been even more certain it was of low quality,” he wrote. Matt Moog, CEO of PowerReviews, previously conducted a study with Northwestern University that drew from an even larger data pool of 400 million consumers, which also found that the more reviews there are of a product, the more likely it is that a customer will purchase that product. “Around 20 [and running up to 50] is the optimal number of reviews for a product to have to give consumers the confidence that this product has been tried enough by enough people,” he told Moneyish. Most online shoppers (97 percent to be exact) say reviews influence their buying decisions, according to Fan & Fuel Digital Marketing Group, which also found that 92 percent of consumers will hesitate to buy something if it has no customer reviews at all. And 73 percent of shoppers say written reviews make more of an impression on them than the star or number ratings, according to Deloitte. I guess that shows why writers beg, plead and grovel for reviews! I always tell people to leave an honest review, too. If you didn’t like my book(s), feel free to say so, and why; but if you did like them, please say that, too (and why). It not only helps me write better in future (and I do take such feedback seriously), but it also helps potential readers assess my books and decide for themselves whether or not they’d like to ‘take a chance’ on a new-to-them author. Interestingly, even negative reviews can help sell products to people who know what they’re looking for. For example, one of my wife’s favorite cookbooks was bought because of a one-star review. The reviewer complained that it was nothing but a selection of the best recipes from four previous cookbooks by the same author. She felt cheated, because she owned the other books, and would not have bought this one if she’d known that. My wife, on the other hand, read the review, and realized that by buying one book, she’d get the best parts of four others. Sold! Another example; several readers, of varying political persuasions, have told me that they’ve sometimes bought a book in that field because of negative comments from reviewers of an opposing point of view. If a left-wing reviewer attacks a right-wing book, a right-wing reader might buy it because of that, and vice versa. I’ve never done that myself, but it makes sense to me. So, dear readers; if you’ve read my book(s), and haven’t yet left a review of it/them on Amazon.com, please do so. Thanks! 32,000 words and counting on book 2. Needed a little bump so I walked over to the Starbucks that also just so happens to be in Barnes and Noble. The Barnes and Noble people would say that I walked over to the bookstore that happened to have a Starbucks inside. Either way, I Win. I got the mango black iced tea sweetened with lemonade. A most excellent choice for a hot summer day. Thanks to all who bought the book so far, especially to Gary and Eric who also left a review. If you read it and like it, please leave a review, it helps drive positioning on Amazon. For those of you with good monitors, you can see that Ashron and Laura are in book two and at least survive to page 85. Dr. Griid may or may not be wearing a red shirt. I haven’t decided yet. That may or may not have been a Star Trek reference. If you don’t know who Ashron or Laura are… Buy the first book. You won’t be disappointed. You’ll have to buy book to to see who Dr. Griid and Sam are. Back at it Gary… Shaking the tree boss. Buy The Book! Search your favorite platform using the listed ISBN number or click on one of the icons below and they will take you straight to it. All books today are driven by reviews online. So if you like it, please leave a review. This pushes the book up into “suggested for you” or “others who bought this book also bought…” status. I hope you enjoy it and let me know what you think.